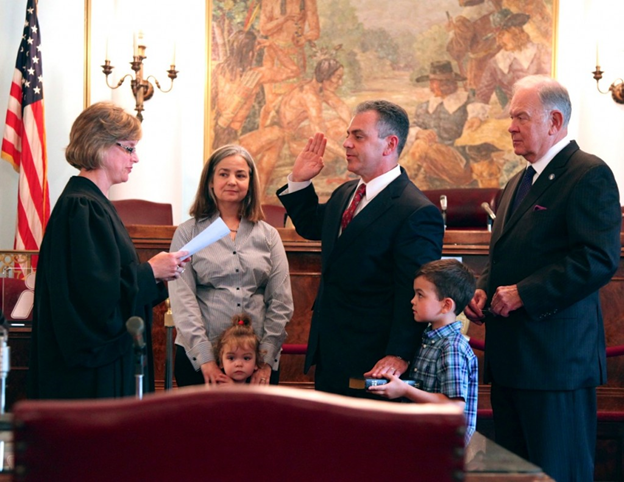 John G. McCabe Jr. (center) with his family and Union County Prosecutor Theodore J. Romankow is sworn in by Judge Karen M. Cassidy at the Union County Court House. On July 2, 2012 John G. McCabe, Jr. was sworn in as the Deputy Chief of Investigators for the Union County Prosecutor’s Office. An expert in the field of drug law enforcement McCabe began his career as an Investigator with the New Jersey Attorney General’s Office in 1987. He brings a wealth of experience to Union County where he will oversee a number of units and serve as a liaison to outside agencies, said Prosecutor Theodore J. Romankow. Additionally, Deputy Chief McCabe will assist in the planning, developing, organizing, coordinating, direction and evaluating of investigative objectives and in overseeing the administration of investigating activities conducted in compliance with state enforcement programs. McCabe began a federal law enforcement career with the U.S. Drug Enforcement Administration (DEA) as a Special Agent in 1990 and was assigned to the New Jersey Division. As a Special Agent, he aggressively pursued high-level narcotics traffickers and money launderers throughout the world. In 2000, McCabe was promoted to Group Supervisor and assigned to the Special Operations Division where he directed and managed several highly successful multi-jurisdictional operations targeting the command and control structure of the Mexican Drug Cartel. In 2003, he was transferred to the Washington Division Office where he led an aggressive Mobile Enforcement Team and Metropolitan Police Homicide Prevention Task Force into Washington DC’s most beleaguered areas, building strong coalitions among police, prosecutors and the public to score some significant successes, including the closure of several homicide investigations. In 2004, McCabe was promoted to Chief of the Mexico Central American Section at DEA’s Head Quarter’s. He spent the next three years of his career managing domestic and foreign investigations linked to Mexico and seven Central American countries with great success. Most notably, he directed and implemented the Drug Flow Attack Strategy, a multi-agency, multi-national collaborative initiative that significantly disrupted the flow of drugs, money, and chemicals between the source zones and the United States. McCabe was assigned to the New Jersey Division as the Assistant Special Agent in Charge in October 2007, where he oversaw two DEA Task Forces groups and the entire Northern New Jersey High Intensity Drug Trafficking Area (HIDTA) Task. As a result his direction and management, multiple drug trafficking organizations were dismantled through arrest, multi-million dollar asset seizures and incarceration. Working with his law enforcement partners throughout the State of New Jersey, he implemented an intelligence led, collaborative, multi-agency initiative to proactively attack the drug threat and the violence associated with drug trafficking. Between February 2010 and April 2011, McCabe served as the Acting Special Agent in Charge of the DEA New Jersey Division. As Special Agent in Charge, McCabe was responsible for the daily operations of the men and women whose primary mission is to enforce federal narcotics laws throughout the State of New Jersey. He started in his new role with the Union County Prosecutor’s Office on July 1, 2012 and replaces Gregory Clay, who retired earlier this year after a 23-year career with the Prosecutor’s Office. Throughout his career, McCabe has received numerous federal, state, and local commendations, including 2010 National HIDTA Outstanding Commander of the Year Award and several DEA Administrator Awards – one of DEA’s highest honors. McCabe received his B.S. in Accounting from Rutgers University and is an active member of the International Association of Chiefs of Police (IACP).